Some years ago part of my work involved presenting live commentaries for broadcast public concerts. A nerve-wracking occupation, certainly, but I became quite adept at handling occasional crises, and we certainly had our fair share of these. On one occasion I was given the cue that the conductor was about to go on stage and I duly announced; "We welcome back on stage to conduct the second half of this evening's concert…". Incredibly, he lost his way and instead of going on stage he entered the labyrinthine corridors which hide all manner of dark secrets behind and under the stages of famous concert halls. While scouts were sent out, I used up every bit of information I had gathered on the conductor, and then some, waffling until he was located and sent out on to the stage. Just as well. I was on the point of speculating over his breakfast menu and pondering whether a laundry, his wife or he himself ironed his own shirts. Then there was the conductor who, having been exceptionally vitriolic in rehearsal to the principal trumpet, had encountered same in the backstage toilet during the interval. Brass players are a little prone to physical violence, and this one was no exception. He punched the conductor who collapsed unconscious into the urinal. As the light went on and I resumed the commentary for the concert's second half, a frantic search was on for both trumpeter (who had left the building) and conductor. It was another five minutes (a lifetime) of aimless chatter before the decision was made to abandon the concert and return to the studio. And then there was the horror of all horrors. A short overture (I think it was Nielsen's Helios) passed uneventfully before the pianist came on stage for Brahms's Second Piano Concerto. From the start it was plain that he was not on top form (allegations of excessive pre-concert refreshment were subsequently made), and as the notes became increasingly wayward and the tone decidedly more desperate, things started to take a troubled turn. Suddenly, following a solo passage with which Brahms would have been totally unacquainted, the pianist slammed down the piano lid, uttered the immortal words, "Sod this for a lark. I can't play this ******* thing. **** it all. I'm giving this ****** game up", and stormed off stage. As the orchestra petered out and the audience gasped in astonishment, my producer, instead of doing the decent thing and immediately switching back to the duty announcer in the studio, turned my microphone on and indicated I should explain to the listeners what was happening. Since the listening public had heard all those asterisks in glorious stereo, it seemed almost farcical to utter that stock phrase, "I'm afraid we appear to be experiencing some technical problems" when the only technical problems lay in the cavities between the pianist's brain and his fingers, but that is what I did. Ever since that ghastly experience, any live performance of Brahms's Second Piano Concerto has caused me to break out into a cold sweat, and if a pianist so much as grunts or touches a wrong note, my heart misses several beats. 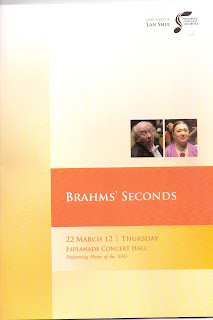 The heart was steady and the sweat glands dormant last night when I heard it live in Singapore, even though there were wrong notes a-plenty and passages where, if truth be told, Brahms had long since been forgotten. And the reason for my utter confidence that the performance would make it to a triumphant conclusion? Seated at the piano was one of the living legends of the musical world, Viktoria Postnikova. Hers was no pristine performance, every note neatly in place, every big chord comprising the requisite numbers of notes, no more, no less. There were huge swathes of clusters where chords should have been, diminished and augmented arpeggios where they should have been simple major or minor ones, and notes which Brahms never would have written even in his early drafts. Some entries only made it on time, others came so quickly they had to wait for the orchestra to catch up. But music is not about playing the right notes, it's about communicating a message, a sensation, a world of emotions, and if Viktoria Postnikova chose to convey the spirit of Brahms over the letter of Brahms, it did not matter one jot. It's a bit like the number 10 bus going along Haig Road instead of Tanjong Katong Road – it still gets to the right destination on time, just gets there a slightly different way. This was a powerful performance in every sense of the word. Seated four square at the piano, Postnikova's hands possessed such enormous strength one wondered if the piano could take all she was giving it. And when, as it did with great frequency, one hand would move off the keys to turn the pages of the score she was so assiduously following, there was no let up in the sheer weight of tone. It was also powerfully emotional, bringing to the fore the great drama which unfolds in this Concerto, and if the speeds were astonishingly slow – it took a good ten minutes longer than most recordings – we never felt it for the moment, so magnetically did she draw us into her grandiloquent reading of this gargantuan work. I recall a performance of Rachmaninov 2 given in London by Artur Rubinstein which warranted a standing ovation (very rare in London), despite one wag suggesting loudly as he got to his feet, "Spot the right note!". True, there were almost as many wrong ones as right ones, but, boy, was it a performance to get the adrenalin flowing. Thrilling, passionate, intensely moving. What Rachmaninov wanted we most certainly got; what he wrote, given the limitations of western notation, we most certainly did not. The problem with music is that its written language gives only a basic guide to what the composer wishes to say, and too many get so absorbed in the superficiality of the written note that they forget the spirit behind them. With living legends like Postnikova, you have every confidence that you will be given the message clear and convincingly, even if you don't always get the finer points of the detail. The other reason we just knew the performance would never falter was the presence – I would say on the podium, but he prefers to stand on the floor where he does not obscure the audience's view of the orchestra – of her husband, Gennady Rozhdestvensky. Another unquestionable living legend. I flocked to his performances with the BBC SO in the 1980s, and still get the same thrill even when he's doing bog standard repertoire with a bog standard orchestra. And what does the great conductor do to turn the SSO into such a brilliant ensemble with just a few hours of rehearsals? The SSO are capable of great things. Sadly, they rarely achieve them on their home soil and with their regular conductor. But those who marvel at the almost inconceivably extravagant claims for the orchestra's greatness reprinted week after week in the programme books, would have seen the light here. 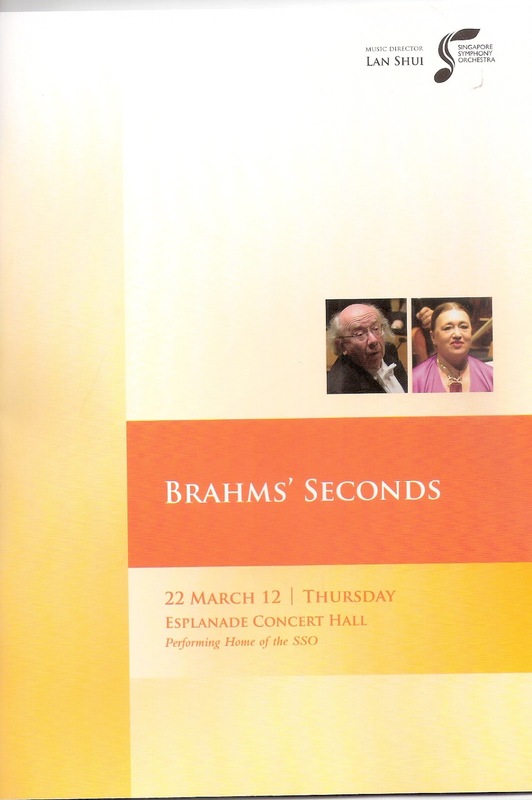 If there was a rough edge, a split note or an intonation issue, it was smothered by the opulence and sheer magnificence of the orchestra's tone throughout both the Concerto and the Second Symphony which formed the second half of this all-Brahms concert. And all that can be put down to Rozhdestvensky's magic touch. The most obvious thing is his total immersion in the music. While other conductors strut on stage in a specially tailored, tight-fitting, tie-less, fashion-driven image-creating wardrobe aimed to draw attention to their importance, and then dance and wave about as if they forgot their pre-concert visit to the washroom, Rozhdestvensky ambles on in white tie and tails, barely moves his body, and through economy of gesture, literally draws the music out of the players. When you study him close up, you realise why things are never going to go wrong, for he, with the most elegant and clear gestures, literally lives the music with his hands and eyes. Every entry is graciously indicated, every closing chord precisely finished with a clever little trick with his baton. On top of that, he not only knows and loves the music intimately, he still finds it enormous fun. Smiles and humorous gestures remove all tension, leaving the music to shine. That is why he is a Living Legend and why, when he appears on stage, hearts beat faster for all the right reasons. I was appalled to read Chang Tou Liang's Straits Times review of the Brahms concert - "Sloppy Seconds" "How dare she need to refer to the score", etc. Were we in a different concert? I was mesmerised the whole evening, so was delighted to read your comments on these Living Legends. You were spot on in every particular. Rozhdestvensky gets a better sound out of the SSO with a Karl Bohm-like quiver of an eyebrow than many a gymnastic conductor can achieve in an entire evening. And Postnikova's performance was truly heavyweight, in the best sense of the word. Roll on Friday and Rozhdestvensky conducting an all Russian programme. Bliss awaits. PS Did you notice the mobile phone that rang out towards the end of VP's encore? We were sitting in the Circle very close to the stage, so could see fairly clearly where it happened. Not a million miles away from the woodwind. Sackable offence in my book. PPS What is the reference in another blog to a forthcoming international move? Sounds like bad news. Well, everyone is entitled to his or her own opinion. Viktoria Postnikova is a great pianist, no doubt, but she had a less than stellar evening. Brahms Two tends to do that to many a great pianist - the scaling of piano's Everest was never going to be easy. Its no sin that she used the score, and that was probably what saved the performance. I'm not against wrong notes and all, but its the inconsistencies (great one moment and much less so the next) that made for a bewildering experience. Anyway, I'm not going to think less of all of you for calling it a great performance. The perfect performance would probably never come.